For as long as I can remember people have been trying to figure out the cryptic Klein serial numbers system used on the early Attitudes and Adroit. Numbers like AT1F3 or ADOD2 left us all scratching our heads. While many owners and even former employees have theorized about what these numbers mean nobody has ever come up with an answer to the scheme. I'm fortunate to have had more than my share of Attitudes and Adroits roll through my garage and so I decided to set up a small database of numbers and try to correlate those numbers to features which can be attributed to specific periods during Klein production phases. My hope was that I would not only figure out the numbering sequence and be able to determine which sequence came after which and so on. First of all I think Klein used the Hexadecimal numbering system. This would easily explain numbers like 1F3 = 499 and OD2 = 210. This make sense as Klein had been in business for a while and they would have to deal with numbers greater than 999 and since they used the rear dropouts there wasn't enough room for a frame identifier (AT for early Attitudes, AD for early Adroits) and numbers in excess of 999. HEX can express very large numbers by using a combination of letters and numbers. I can't help but wonder if Gary's time at MIT didn't help influence this?? I've reviewed this with Gary and he confirms that he did in fact use HEX since the very early days. Which explains why even some of the 85 Mountain Kleins have HEX numbers. 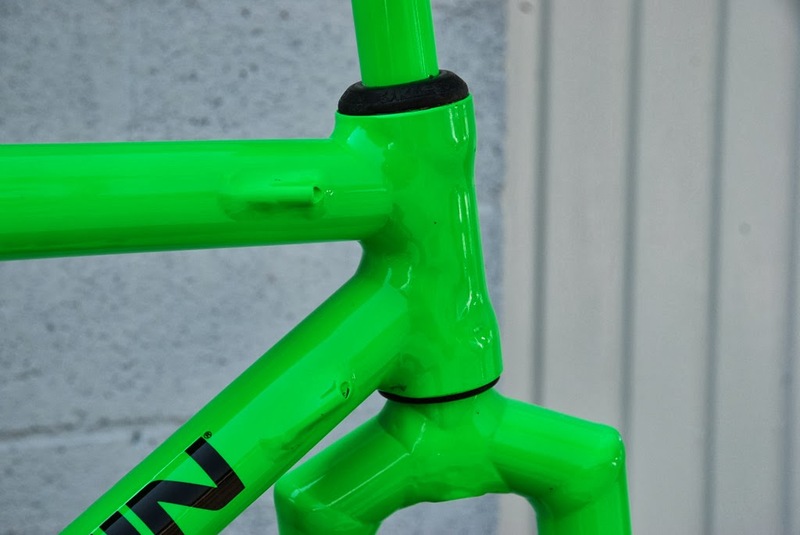 I've never taken much interest in road frames, but the little bit that I've looked at indicates that those too used HEX numbering for the S/Ns. I believe that early Attitudes started with the ATxxx serial numbers. Each serial number was preceeded by a small Klein logo (K). I've read on old forums that the first batch of Klein Mission Control headtubes were either undersized or reamed too much causing problems with the bearing fit in the frame (either too tight or spinning). Some Klein employees seemed to remember that once the problem was resolved the serial numbers were changed to BATxxx. I think the change over happened around #302 made as Attitude B(K)AT12E had a B added in front of the (K) symbol implying that the problem was found, fixed and that one frame which originally would have received the bad head tube was fixed and that's why the B was added later in front of the (K) symbol. Following that transitional frame I see a majority of BATxxx Attitudes and only a couple more ATxxx Attitudes, implying a switch over to BAT. After collecting numbers for another year or so I've found that ATxxx frames continued on (up to AT28d or 653) for a while after AT12E (#302) implying that either the problem wasn't resolved right away, or that the addition of the B to the serial number wasn't correlated with the head tube issue. It's possible that the process changed and the S/N schema was revised later on for another reason. More and more I think that the change had more to do with subtle frame redesign including the cable inlets, top tube length and the head tube fix. That would make more sense to me, but I don't have any confirmation that this is what actually happened. I believe that ATxxx Attitudes preceded BATxxx Attitudes because all ATxxx Attitudes have the downtube cable inlets located above the centerline, a feature known to be found only on very early bikes. While very few BATxxx Attitudes are found with those same cable inlets. All of the ATxxx and BATxxx Attitudes I've identified had box forks, solid black decals and the Klein stamped headset seal. So, I think it's safe to say that if your Attitude has an AT or BAT serial number it's a 1990. Fork serial numbers in 1990 would start with 5A. In total I believe that Klein made around 2300 Attitudes in 1990, give or take. The highest fork serial number is right in that range so that seems to make sense. While 1990 was the introductory year full of discoveries and changes, 1991 and later 1992 were both years of mass production and relative consistency of features. 1991 was the year Klein introduced the legendary Uniklein (round crown) fork. Evidently the early box crown forks were somewhat prone to failure and sometime in late 1990 early 1991 Klein switched to the stronger and somewhat less harsh Uniklein fork. I've identified very few 1991 Attitudes with factory installed box crown forks, but they're out there. I believe that 1991 Attitude frames had a serial number format Axxx and the forks had a format AOxxx. The earliest Axxx Attitude I have recorded is #92 and the highest is #3498, while the highest fork comes in at #3757. The higher number might account for extra forks built to replace broken 5A box crown forks. 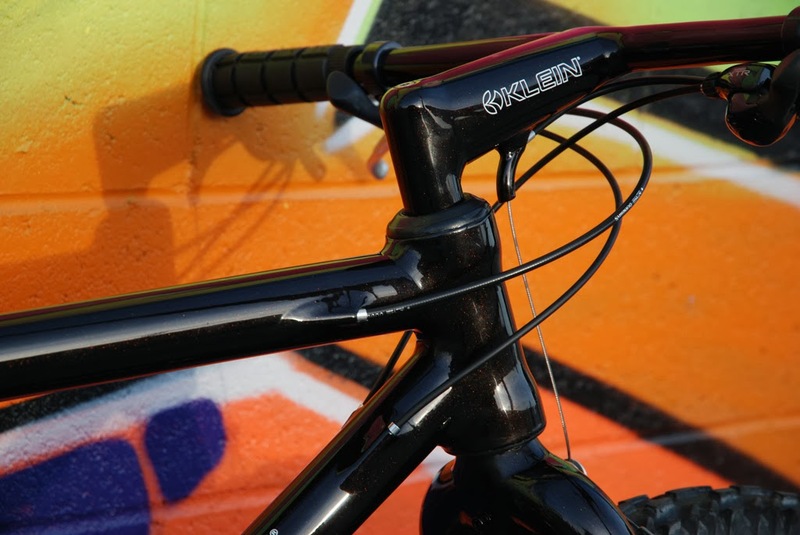 At some point, either in late 1991 or early 1992 Klein relocated the serial numbers from the rear dropout to underneath the BB shell. This provided more space and allowed them to use a longer string of characters. This led to the new ATxxxxxx format. Out of the 60+ Attitudes I've only spotted two with this format ATT000111 and ATT002433. Although I do not have enough data to prove this it seems that sometime around late 92 Klein switched the fork serial format to Axxxx, with the highest number in my record of #2203. So, it would seem that Klein built somewhere around 3700 Attitudes in 1991 and perhaps another 2400 in 1992. The fork numbers don't seem to corroborate this, but this is still a fairly limited data set. It's also very likely that the number of rigid forks would be less than the number of frames since 91 and 92 saw wider adoption of suspension forks, hence fewer rigid forks required to outfit frames. The 1993 Attitude was the final version of the MC1 Attitude and it was the model year most closely related to the Adroit. Unlike it's predecessors which had a 1 1/4" (27.2mm seatpost) seat tube the 93 Attitude went up to the 1 3/8" seat tube (31.6mm seatpost) used on the Adroit. This reduced the seat tube extension above the seat tube from 6cm to about 2. Also, unlike the earlier Attitudes with a 1 5/8" down tube the 93 Attitude received a larger 1 7/8" downtube, closing in on the massive 2" downtube on the Adroit. Also Klein stopped using decals in 1993 and started debossing their frames. 1993 also marked the introduction of a new serial number scheme. The fairly non descript ATTxxxx was first replaced with T for Attitude then MMYY for month and year of production followed by xxxx denoting the number of the frame in the overall production line. At some point Klein added the frame size (19 or 20...) in front of the T.
The highest number 1993 Attitude I have recorded was from April of 93 at #1695. The previous number was from February at #1271. 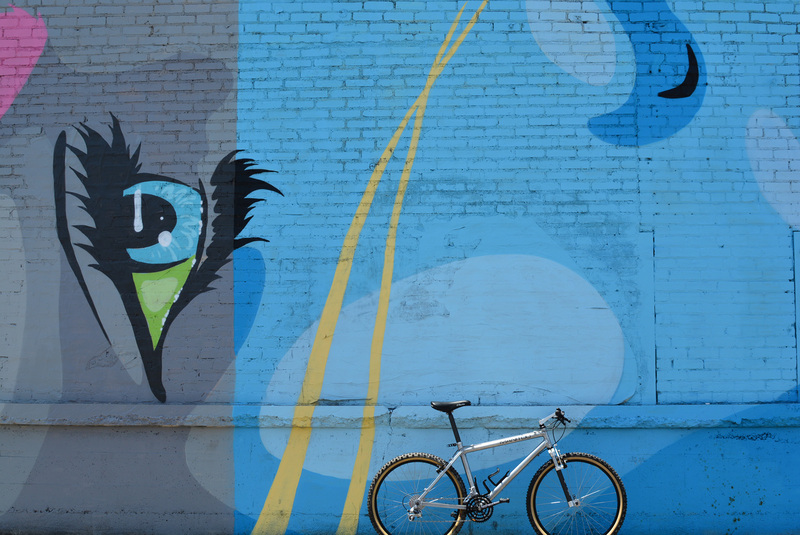 So it's safe to say that another 200 or so were made before production switched to MC2 bikes in July 1993. Although 1993 was the last official production year for the MC1 Attitude the rollout of MC2 bikes was slow and Klein sold a small quantity of MC1 Attitudes in 1994. I have very little data on this but I think it's safe to say that 200 more MC1 Attitudes were built and sold as 94 model year bikes. So, in total this would bring production of 93/94 MC1 Attitudes to around 2000 give or take. All in all I estimate between 8,000 - 10,000 MC1 Attitudes were made by Klein between 1990 and 1994. The data set supporting these conclusion is relatively small compared to the total production numbers, but it is the largest such data set ever compiled. So, although these conclusion are made on limited data they seem plausible. If you want to help please submit information for your bike or any others that you know of for sure via my blogger contact form. First off, this is great info. NICE WORK! In the 80's and into 1990, the serial numbers were a plain old alphanumerical count. In 1990, the first letter would be "A" and the plan was to have the following years go through the alphabet to keep track of what year a frame was built in. All models had the same count behind them. The Sales people were getting a lot of questions about how to identify frame years, models and sizes. We started putting "AT", "AD" "P" etc. for the model throughout the 1990 season. Then in 1992 we started separating the number of frames made to each model in the serial number by starting all models at zero in September of 1990 I think. After that each model had a tracking of it's own. In 1993 I think it was, the Bottom Bracket serial number was born and an intelligent numbering system was created by Darrel Voss that seemed to make sales happy. Serial numbers were the biggest complaint from sales to production there was and we had many heated conversations about them. In the 80's they were a mess. All they were was a alphanumerical count. No year designation at all. The count went from about 1982 through 1988 or 9. I stamped about 70% of them through that time. Each day would start with stamping enough drop outs for the day of welding. Each number was hand written in a log book with what model it was. That was pretty much all of the records kept back then. Hope some of this helps. My dates might be a bit off but they are close. September was the model year changeover every year so all serial numbers/models started over or changed on September 1st. Any information on the Rascals produced from 90-93? I have a Rascal with S/N: RTT000431 Is there any way to tell at least the year from that? Can somebody help me by dechipering of a Pinnacle? Hello! Thank You very much and sorry for the late answer. I did not buy that frame, but now I managed to bux a complete bike. Klein Pinnacle with XT 737, but with old XT 730 seat clamp, front derailleur and head bearing. According to the equipment it could be a 1994 one, but in 1994 I think the "Pinnacle" decal was on the front part of the upper tube. The front fork is Spinner and according to the 1990 cataloge a chrom fork came in frameset with the frame. But if it is from 1990, the decal should be black. Could You please confirm me this? Hi, does anyone have an idea what Klein serial ptt000418 could be? I managed to buy a complete Pinnacle, Bright Green, but it is with mixed parts. XT 737, but with old XT 730 seat clamp, front derailleur and head bearing. Could You please help me also by this production year? Unfortunately I don't have good records for Pinnacles so I can't really nail down the exact year for you. 1993 and on would use debossing instead of decals and also in 1993 the serial numbers in general adopted a year/month formal. So, without seeing it's very hard to take a guess. But if I had to I'd say 1992 or older. Hard to say for sure, but I'd guess 89-91 maybe. FWIW it was the same frame throughout its life, so it's not super important to pick one year over another. I'll take it for 1990 one because of the fork. But the decail (Pinnacle) is like in the 1992 catalogues. I have a Attitude with BAT4fo serial number. that makes it a 1990? For a 1990 Attitude you'll need a 31.8mm front derailleur clamp. If you want to run M900 on a 1990 (which I wouldn't do) then you will need to replace the spindle with a 108mm one vs. the 125mm that is most likely in there if you're running M730 series XT. Hey! great post. I have a Pinnacle and it has the early chainstay marking "PDDA" I'm the third/second owner. The bike was ordered for a guy who ended up not wanting it, and I bought it from its first real owner. I believe it has custom paint but factory dimensions. Any clues on the exact vintage? I've looked everywhere and there are no numbers to be found on the frame. Would appreciate any info. Thanks. That is frame #3546 so I'd imagine maybe a 90-91??? Hard to know without looking at photos. I have a rigid, large diameter aluminum fork that I am trying to identify the manufacturer of. 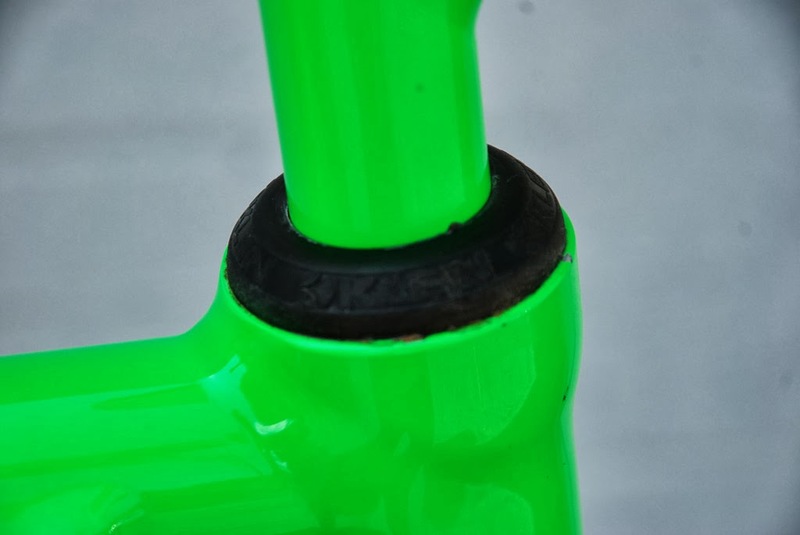 Looking at photos on the net, it appears to be a Klein fork, Stamped on the backside of the right hand leg dropout is the serial number: A115A. Would this confirm that it is a Klein? If so, could anyone offer any more specific info like the year or model? Thanks! Great information. Thank you! Today I decided that I am going to resume 1) Skiing 2) Biking. I bought my Klein Attitude late in the late 90's, early 2000's from a local shop. Was a trade and in mint condition. Paid $400. I always loved the bike. Was nicely surprised when I began looking this morning to see if my old bike was worth putting a bit of work into. I'm now ashamed of it's condition after letting it sit for 12 yrs. Needless to say I'll be putting some time into it before I drop it for repairs and a tune up. Serial number on the rear drop out is AC26. Paint is Sunburst Linear Fade. 1992? I have a Klein Attitude, serial #A 728. Can someone tell me the year? Do you have any advice for me to learn more about this number? Or at the very least be able to date the frame? I have the chance to purchase an old (1991?) Attitude frame (A4E1?) with (boxed) fork (AO0398). Interestingly it is a custom made paintjob - ordered from Germany; painted at the KLEIN factory (the seller says..) - a mixture of bright green and the yellow from the backfire (in the middle of all tubes). Underneath the green/ yellow paint one cannot find any paint from an old paintjob; not even inside the tubes (besides... the screws for fixing the water bottle-holder). But - the cable guide underneath the bottom bracket is painted over and the headset cap is not stamped. What would be your verdict - worth buying (yes - of course it depends on the price ;-)); worth collecting? Frame formats were ATXXX or BATXXX for 1990, AXXX for 1991, ADTXXXXXX for 1992 and TXXXXXXX for 1993-1996. AO was the number used for forks. Would it be fair to assume my Pinnacle, PTT000038, would be a 1992 format serial? Shimano date codes indicate components were produced in December 1991. Passed down story is the Bike was a special order...Candy Red with XTR Groupset. That sounds about right. Shoot me some pics to confirm. Can someone identify frame # R35F90? I believe it's a Pinnacle. I believe I have a Pinnacle stamped on the drop out is R35F8D can someone let me know what year and model for sure ? Its bright green and has no decal besides the white with black KLEIN . also has three water bottle spots two on the top of the lower tube and one on the bottom of the lower tube. I LOVE THIS BIKE and want more info on it. THANK YOU ! yes, that's a Pinnacle, probably 1990 or 91. The 35 indicates that the rear dropout spacing is 135mm and not 130mm like on the earlier models. Two bottle cage mounts on the down tube means it's the XL frame size.